Demandbase recently closed $65 million in funding to fuel the growth of its platform, highlighting that investors in the B2B tech landscape see massive potential in how these types of solutions can positively impact marketing initiatives. Demandbase, a provider of ABM technology, has announced the appointments of Kelly Cook as VP of Product, Advertising Solutions and Dom Lindars as VP of Product, Marketing Solutions. The company said both Cook and Lindars will help support Demandbase’s expansion of product offerings with artificial intelligence and machine-learning technologies. The practice of ad retargeting — displaying targeted messages to visitors who have left your site when they view other sites — has been a page in B2C marketers’ playbooks for quite a while. Today, however, B2B marketers are embracing retargeting even more warmly, and for good reason: It is a cost-effective way to keep your brand in front of B2B decision makers during what is typically a long buying cycle. The average click-through rate online for display ads is .07%, while the average click-through rate (CTR) for retargeted ads is about 0.7%, according to research from Criteo, a company that specializes in performance display advertising. Criteo studies also found that visitors who are retargeted with display ads are 70% more likely to convert than those who are not retargeted. Demandbase, a targeting and personalization platform, launched B2B Retargeting, which is designed to help B2B marketers maximize their ROI for company-targeted advertising. 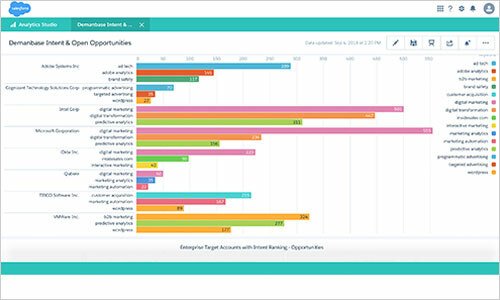 The new Demandbase solution enables B2B marketers to establish criteria for relevance and readiness to buy and automatically display ads to prospects who exhibit those buying signals. Demandbase last week announced the closing of a $15 million funding to support accelerated growth of the company’s online advertising and web site optimization platform, according to Demandbase officials. Demandbase, a provider of B2B marketing technology solutions, today announced a new online ad-targeting service designed for the business-to-business market. The company's Demandbase Company-Targeted Advertising platform will allow B2B advertisers to deliver online ads tailored to specific companies or to groups of companies that match particular attributes. The platform also includes measurement and performance analysis tools.